We are experts in the field of waste valorisation using sustainable and efficient technologies to benefit from waste and sub-products with a view to providing added value to our clients’ processes. We specialise in the exploitation of industrial waste, post-consumer waste and agrifood by-products. We also work to characterise and develop waste-derived fuels (WDFs) and the chemical recycling of plastic and composite materials, among others. 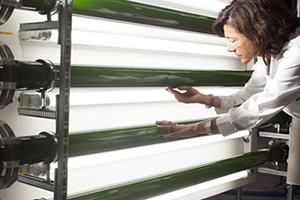 We develop technologies for the design of integrated microalgae biomass biorefining processes. Our laboratory and pre-industrial escalation equipment – which includes, among others, tank-type reactors, a fluidised bed reactor, a pilot plant for biodiesel synthesis, another for microalgae production and yet another for supercritical fluids – enables us to analyse the behaviour of plastics, biomass and waste in biodiesel, solvolysis, pyrolysis and gasification processes and to optimise the reaction conditions and scale up processes. Development of chemical plastic-recycling processes and the production of biofuels. Development of waste and sub-product valorisation operations and secondary fuels.